Fair Hill, MD-October 16, 2010- Nate Chambers, 23, of Vienna, VA, maintained the lead in the United States Equestrian Federation (USEF) CCI*** at the 22nd annual Dansko Fair Hill International Festival in the Country following the cross country test on Saturday. Riding his 14 year-old warmblood gelding, Rolling Stone II, Chambers ended the day with a penalty score of 46.6. "I was very happy with the way he went today," said Chambers of 'Rolly'. "I had a thirty minute hold on the course so that made it a little difficult, but I just had to put it out of my head and keep going." The student surpassed the teacher in the CCI***. Phillip Dutton, of West Grove, PA, who just returned from the 2010 Alltech FEI World Equestrian Games as a member of the USEF Eventing Team, also trains Chambers. Dutton and Fernill Eagle stand third following the cross country with a penalty score of 53.0. "We're still working on our partnership together," said Dutton. "But I was quite impressed with him today." Last year's CCI** winner, Hannah Burnett, Ocala, FL, is in second place with a penalty score of 49.4, riding Richard Thompson's 9 year-old Thoroughbred gelding, St. Barth's. "I had a really good feeling going around," said Burnet. "He jumped really well." Clark Montgomery, from Chatsworth, GA, also managed to keep his first place score from dressage on Thursday to finish the cross country test in the Dansko Fair Hill International/USEF CCI ** Fall Eventing Championship, with a penalty score of 46.1 on Loughan Glen, owned by Holly Becker and Kathryn Kraft. Montgomery moved up from 4th place in dressage to 3rd with Universe, his second horse, owned by his wife Jessica. The pair finished the day with 50.4 penalties. Erin Sylvester of Kennett Square, PA, stayed in second place with her 9 year-old Trakhener gelding, No Boundaries, going double clear for a penalty score of 47.8. Competition culminates with the show jumping test on Sunday. This year's Festival features a wide array of family entertainment and attractions at the Fair Hill Natural Resources Management Area in the beautiful countryside of Fair Hill, MD. Among the favorite events returning to the Dansko Fair Hill International Festival In The Country is the classic car display on Sunday (weather permitting). Spectators will be able to reminisce and young car enthusiasts can make a new connection with icons from an earlier era. The Kids' Corner will also be open with a variety of activities for the younger set. Miniature horses perform at 11:00 a.m.
Members of the United States Pony Club return on Sunday in the President's Cup Invitational Games to compete in a variety of challenging and entertaining relay races at 10:00 a.m. Awards will also be presented to the winning teams on Sunday. Visitors to the Dansko Fair Hill International Festival in the Country will have one more opportunity to shop for that "must have" item in the popular Country Shops, which feature over 40 vendors selling tack, jewelry, artwork, pet needs, exceptional apparel and fine gifts for the approaching holiday seasons. The VIP Tent offers fine dining, while visitors seeking a more casual snack or meal will find pubs around the Fair Hill grounds serving classic Maryland crab cakes and other treats. In fact, the Maryland Department of Agriculture named the Fair Hill International as a "Maryland Top Event!" 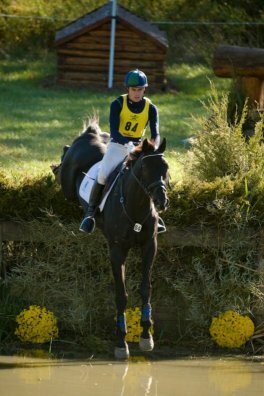 Labels: Chambers, Eventing, Fair Hill, preliminary results.